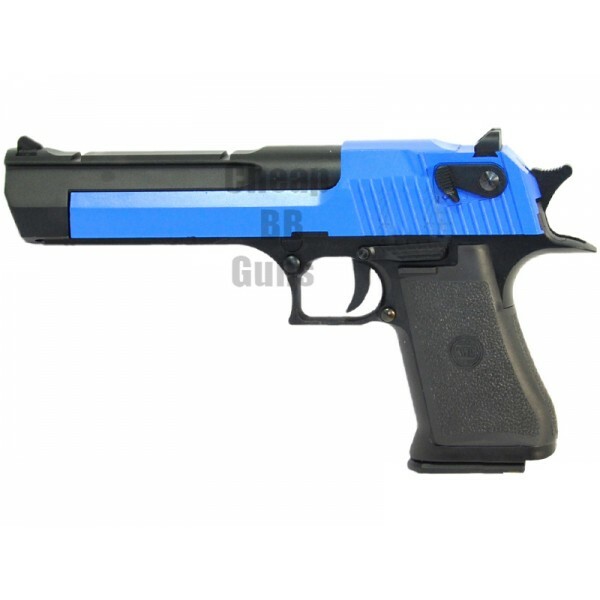 Developed by the well-known airsoft and BB gun developer and researcher KWC, the Eagle Co2 Blowback pistol is small, blue in colour and a perfect fit for your arsenal of airsoft skirmish guns. The semi-automatic pistol is preferred as a secondary or standby BB gun by many pro and amateur airsoft skirmish players, mainly because it is a 350 FPS single-shot pistol. The BB gun will make a great addition to your existing collection of BB guns and is a great bargain when purchased on cheapbbguns.co.uk. Whether you want a pistol for your airsoft or paintball skirmish games or for target practice, the .50 Eagle Co2 blowback pistol is an excellent choice. The BB gun is made entirely of metal, which makes it seem like a real pistol. It is, however, partly coloured in blue, to give it the distinction of a BB gun. Like other blowback pistols, the Eagle Co2 pistol is powerful with an FPS of 350. It has a rubberised finish at the handle, giving the user a solid grip. This makes it a great choice for those looking to buy small pistols for target shooting practice. The BB gun comes with an adjustable hop-up and weighs a little more than 2 kg. The gun has a magazine capacity of 24 rounds, and extends to around 270 mm in length. BBs released from the powerful Co2 blowback pistol can hit you hard, if you do not have the right protective gear. The BBs are small pellets, but when shot from the KWC Eagle Co2 blowback, they can even injure you. Care should be taken to protect your face, eyes and other sensitive parts of the body with accessories like face masks, safety eye wear and vests. NOTE - Safety gear must be used when using this BB gun to prevent injuries.